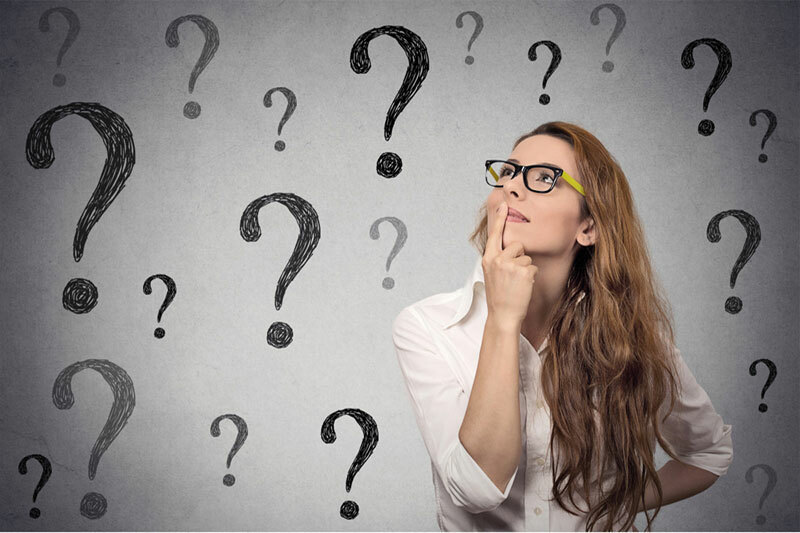 We trust that if you have any unanswered questions, you will be able to find it below. You can also have a look over our published Operational Guidelines and Terms & Conditions of Hire which has more in-depth information on how we do business. Go to our online booking page to ‘Book online’ or our ‘Contact Page’ for more details on contacting us and making a booking. We endeavor try to match the size and style of bin to suit you needs. With such a comprehensive range of sizes we are confident that we have the right bin for you. This way you pay no more or no less than you really need to. Our rental period is also flexible so that if you need a few days extra we will in most cases not increase the price. Our prices are inclusive of GST, delivery pickup and disposal. For actual prices refer to the ‘Price Guide’ or click on the link on the Handybin or Big Bins pages. For some waste types a bin weight limit is calculated in the pricing. For loads that exceed the allowance an additional disposal fee will be charged. This amount per tonne will vary depending on the nearest disposal option. How do I pay for the bin? You can pay our drivers who will issue you with a tax invoice and/or receipt on request or you can call our office and pay by phone using your credit card. We also accept payment via the internet by arrangement. Payment must be made prior to removal of the bin. How long does it take to get a bin? Generally we like to book bins 24 hours in advance (book NOW and we will deliver your bin tomorrow). Often we can deliver a bin on the same day depending on how many bins are already booked, the location and whether the run/deliveries to your area has been completed for the day. Our normal rental period is a period from 1 to 7 days. If you require a longer period just ask our sales staff what the cost would be to keep the bin a little bit longer. Once you have filled the bin please phone our office to book in a collection. Whilst we quote a 7 day rental period we find many people ring within two days to have the bin picked up. This is because bins are such a convenient and easy way to get rid of rubbish, you get the job done sooner and have more time to do other things. My bin is full when will it be picked up? Once the bin is full please contact our office and let us know or you can ‘Book a Pickup‘ online. Many people finish before the allotted days and we can often pickup the bin sooner. Whilst we endeavor to remove bins ASAP, due to having to schedule trucks, disposal facility opening times, weekends, public holidays etc we may need to schedule the bin to be removed on or after the allocated days. There is no additional charges when this occurs. We also do not assume that bins are ready as we have found out over many years that sometimes things change and we arrive to be ask if the bin can be left another day. To avoid this occurring we ask that customers ring us to confirm the pickup. If this does not occur we will ring after the allotted time frame has expired. Bins may be filled to the top rail, no higher. Bins filled above this level pose a safety risk during transport. For more information on correct filling and use of bins refer to our Guidelines page. For safety and legislative (i.e road rules, load limits etc.) reasons, skip bins should not be filled any higher than the top rail and should be loaded carefully in order to avoid any spillage during transit. In the event that a driver arrives to collect your bin and it has been overfilled, we reserve the right to remove some of the contents and/or charge an extra amount for the excess. You can also choose to book another bin for the excess which will be charged at the appropriate rate. Where possible the driver will try to take the skip once the overloaded item/s are removed. Where possible the item/s will be left in a neat pile next to where the bin is. If the driver is unable to do this the bin will be left onsite until the offending items are removed. An additional transport charge will apply in this situation. Handybin – Big Bins ‘do not transport regulated wastes‘ such as asbestos, tyres, wet paints and liquids (includes drums containing liquids) etc. Some waste types are restricted or semi-regulated and may need to be handled or disposed of in a specified manner. If you require any information or have any concerns about any waste items please contact our office. Asbestos Products – any fibro sheeting or other products that contain asbestos materials not clearly marked “Does Not Contain Asbestos” needs to be treated as containing asbestos. This includes Hardiflex, Villa Board & compressed cement sheeting. Asbestos was also used in the production of other items including insulation and piping/plumbing products. If you come across any material or product which is of a fibrous nature and is not stamped “Does Not Contain Asbestos” it should be treated as containing asbestos and as such should not be placed into our bins. WARNING: If we dispose of a bin and discover that any regulated waste is hidden in the bin we reserve the right to return the bin and offending items to your site and pass any costs associated with doing this. Please take the time to read our ‘Terms & Conditions of Hire’ which covers this. If you are a trades person undertaking a job and you attempt to conceal regulated wastes in a bin we will lodge a report with the EPA & WH&S. Fire ants are dangerous imported pests that could spread to large areas of Australia, severely damaging the environment, our outdoor lifestyle and the agriculture and tourism industries. One way of ensuring your site is free from fire ants is to check the site prior to any disturbance. This allows you to see whether fire ants are present before any work is undertaken. A restricted area and movement controls are in place to restrict the spread of fire ants in areas of South East Queensland. The restricted areas are divided into zones which have different movement requirements. Restricted items include: soil (includes fill, clay, overburden, scrapings, topsoil, decomposed granite (deco), potting media and any other material from the ground), mulch, manure, bark, hay, pot plants, potting media, turf, sleepers/logs, gravels, poultry litter. Whilst we have an Ant Risk Management Plan (ARMP) in place it is important to note that the responsibility for site assessment is the person, business or company undertaking the disturbance of soil or materials onsite. Once items are placed in a bin we have no way of determining the presence of fire ants. The National Fire Ant Eradication Program has made significant progress in eradicating fire ants from Australia. Surveillance is ongoing, and treatment and containment measures are continuing in areas of South East Queensland where the ants have been detected. If you have any concerns or require an inspection, contact Biosecurity Queensland on 13 25 23 prior to the work starting. Often old cans of paint are already dried out. If the paint is dried and hard it can be placed in the bin. To dry any wet paints we suggest that you could leave the top off the can and let it solidify before including it with your rubbish. If there is a large amount of paint, try placing scrunched up paper (i.e. newspaper) in the bottom of a cardboard box and tip the paint in to make it spread out and dry quicker or mix it with soil, sawdust or other absorbent materials and allow it to dry. Once dry, it can be disposed of with your normal rubbish in the bin. What about hazardous or toxic waste? We do not transport restricted, regulated, hazardous or toxic waste types. For pesticides, herbicides and other chemicals, contact your local council for details of when and where they hold their collection days for these items. How can I estimate what size bin I need? 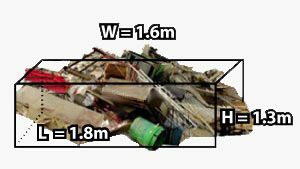 Multiply the ‘length x width x height‘ to calculate the bin volume for your rubbish. Can I place dirt, concrete and bricks in a bin? How do I calculate the bin size I need to dispose of broken concrete? Over many years we have managed to create a formula that gives an accurate estimate of the bin volume you will need for broken concrete. Double the above figure = 3.6 cubic metres of bin space. How do I calculate the bin size/capacity I need to dispose of roof tiles? Depending on how well tiles are broken 80 -100 sq. metres fits into a 6m bin. If we use 90 sq. metres as an average then divide by 15 (90/6=15) this equals 6. So a 6m bin would be required. Simply divide the square metre of roof area by 15 to calculate the number of metres of bin space required. i.e. A roof is 180 sq. metres – divide by 15 = 12 which would be 2 – 6m bins (refer to FAQ 16 for weight limits on bins and ‘Guidelines for Heavy Materials’ for more information). Wheel barrow doors are available on all 6m, 7m 8m & 9m bins. They are also available on some 4m & 5m bins. The door is 750 mm wide which will accommodate a large tradesman’s wheelbarrow. The doors are located at one end of the bin (facing the road if we were to place the bin on your driveway). Only in certain circumstances are we able to turn the bins around (a charge may apply). We also have 6m tailgate bins (lift on-lift off bins) available for jobs that need a rear opening door. The tailgate acts as a ramp into the bin and sits less than 60 mm off the ground for easier loading. The width of the tailgate is 1.500 metres. NOTE: The 4m & 5m bins with doors and the 6m bins with rear tailgates are very popular and may not always be available. If you make an online booking we will confirm availability as soon as possible. If you need to know sooner please contact our office on 3821 3200. I need a crane bin! Our crane bins are hired for situations that require a ‘lift up, lift down’ solution and not for repeated emptying of bins. This is primarily due to the excessive damage that occurs in situations where this occurs. When hiring a crane bin we need to know how the bin will be used. Any damage that occurs to the bin because of repeated work and any resulting wear and tear is a recoverable cost from the hirer if applicable. By hiring a crane bin you unconditionally agree to pay these costs. Can you explain how I can work out what size bin I need? By spending a small amount of time packing bins properly you will get great value from the use of our bins. Good packing eliminates excess ‘air’ holes and ‘spaces’ between the items you are placing in the bin. Cut tree branches into smaller pieces and break down items such as old furniture etc. We use our own bins so when it comes to packing bins we have become very skilled and expert in getting the most into a bin. A normal household wheelie bin is a 240 litre bin which is a little over 4 wheelie bins for every cubic metre (see table below). If you were to tip a number of wheelie bins into a skip or bin you would get at least this amount into every cubic metre, remembering that the type of rubbish in wheelie bins packs down better than the type of rubbish most likely being placed in a skip bin. Find out more about bin size comparisons on the ‘Bin Sizes & Prices‘ page. Bin dimensions are a near as possible guide only as some differences exist when bins are manufactured, repaired or re-floored. How much rubbish that can go onto a trailer depends on how high you are willing to pack it without over loading the trailer or making the load unsafe? If you are unsure or require any additional information on the sizes or capacity of bins please contact our office. We have created the ‘Waste Types‘ page to help you to choose the right bin for your rubbish removal needs however if you still need more information feel free to ring us for free friendly advice on 3821 3200 or contact us by email. We believe waste disposal should be the last option. We achieve this by managing the types of waste handled in our bins. The benefit of this is that certain waste types once separated may result in savings to our customers. Why do we ask what waste type you have? Firstly we need to match the size bin that best suits your needs and secondly to ensure that once a bin is filled we can lift it back onto a truck and ensure that the truck can safely transport the bin. Once this consideration has been made we then look at various waste types and what opportunities and locations we can dispose of certain waste types. Sometimes this may result in an opportunity to offer a discount on some waste types. We have put together the information on the ‘Waste Types‘ page to help you to choose the right bin for your rubbish removal needs however if you still need more information feel free to ring us for free friendly advice on 3821 3200 or contact us by email. MIXED or COMBINATION LOADS – because all the facilities we dispose at recycle waste, loads can include a mixture or combination of different waste types. – Please contact our office if you require any further clarification or need any advice in relation to the handling of specific waste types in our bins. Where will the bin be placed? Generally we try to place the bin within your property. If this is not possible we can place the bin on the footpath but we cannot block pedestrian access. Some Council’s require a permit which we can arrange for you. How much clearance do you require to deliver a bin? Trees, power poles, street signs, low building lines, narrow gateways, essential service lines & pits etc pose constraints on our ability to place bins where customers request them to be placed. As a guide we require the following clearances to safely deliver bins. The clearances vary according to the size truck we require for certain size bins. Please contact our office if you require any further clarification or need any advice in relation to clearances required to deliver bins. The general answer is no. However you can apply to your local council and/or the police to obtain permits to do this. We do not offer this as part of our service due to the complexities of obtaining such permits. Can I move the bin once it is placed down? No. Moving the bin may result in us not being able to recover the bin from where you have moved it to. It may also result in damage to our bin or truck and/or your property. Any associated costs will be recoverable from you in these situations. It is your responsibility to ensure that the machine operator does overfill the bin or abuse our property. Please be aware that this is a common occurrence with machine operators so make an effort before they start to inform them of our guidelines. Is there anything I cannot put in the skips? In accordance with Environmental Legislation, asbestos products, tyres, liquids, paints, or general hazardous materials cannot be disposed of in our skips. If you require more information on this please contact our office. What else should we know about hiring a bin? Whilst the bin is on hire by you, you have a responsibility to look after our property. Please note our published Operational Guidelines and Terms & Conditions of Hire provides a comprehensive list of conditions for the use of bins and services provided by Skip Bins Brisbane Group Pty Ltd t/a Handybin Waste Services and RMG (Qld) Pty Ltd t/a Big Bins & A Big Bins. I need a bin outside of your normal hours of operation, can this be done? We can provide our services for specific situations outside of our normal hours of operation by arrangement. Please contact our office to discuss this and obtain a quote. Recycling is such a big thing these days, do you recycle? Our focus is on the redirection of waste away from landfill to alternative uses. Whilst not all our waste can be handled through our own facility we extensively use businesses and other waste disposal facilities that accept waste and continue to apply greater levels of extraction and resource recovery than are possible in our own facility. In this regard 100% of the waste that is transported by our business goes through some form of reduction or recycling into saleable items or bio-energy. For more information on recycling refer to our Recycling page. I live in area within a local authority that you service, why is the cost of my bin higher than other suburbs? The greater Brisbane Region is growing all the time. Some areas within local authorities extend outside of what we class as a reasonable distance to travel to provide our services. In these situations we apply a ‘zone charge’ to travel to these areas. Two examples of this are the southern area of the Redland Shire and the Western areas of Brisbane such as Moggill. Our prices are based on the ability to be able to maximise the use of our vehicles by doing multiple deliveries and pickups on a run. In an outer lying area this means we do a run of an extended period of time without the ability to do additional deliveries on the way. The value of the vehicle time to provide service to these areas may actually be higher than the price we charge for the bin. In these situations we may apply a zone charge which is a nominal fee not the full cost of the use of our vehicles. We require a bin in an area that you provide limited service to? As we mentioned above Brisbane is becoming a large geographical area. We are unable to keep extending out to provide service to this growing area, however we are able to cover some of the areas in close proximity to Brisbane. Please check with our office if you require delivery to any of the listed areas. If you book online we will respond to you to clarify if we provide service to your area. We found your advertisement in the Yellow Pages and it says ‘all suburbs’ but you do not deliver to our area? Sensis Yellow pages delivers the Brisbane Yellow Pages to areas outside of the Brisbane geographical boundaries and as such we get phone calls from near and far. If this should occur to you we will be happy to refer you to a company that is more local for you which we believe will provide the same level of service to their customers as we like to do. It all seems too complicated? Unfortunately due to ‘incidents’ over the years we have had to put time and energy in developing our ‘Operational Guidelines and Terms & Conditions of Hire‘ to recover costs associated with the abuse of our property. So to keep it simple, as a general guide fill the bin up, no more and phone us to have it removed. We prefer uncomplicated situations and hope common sense is applied by all. What is the difference between traditional Skip Bins and Skip Bags? A new product/service in the rubbish removal market are bags called Aussie Skip Bags or JumboBags. In some situations Skip Bags or a Jumbo Bags may just be the answer but it is important to make the right choice for your rubbish removal needs. Traditional skip bins are constructed from steel that allows for repeated rentals along with the ability to manage the lightest to the heaviest loads, from paper, cardboard or green waste to dirt, soil, rocks or concrete. Of course every Skip Bin or Skip Bag will have a weight limit due to their design and construction along with road rules, carrying and lifting capacity limitations and general safety which impose limits on the safe handling and transport of Skip Bins and Skip Bags. We have tried to simplify the advantages of our Handybin Bins and Big Bins versus the new Skip Bags. Perhaps if you have used Skip Bins or the new Skip Bags and discovered more advantages you could email us so that we can update the information in the following table. Help us find out which type of rubbish removal option gets the most ticks. We do not supply Skip Bags at this point in time however if demand for Skip Bags grows we will introduce this service sometime in the future. In the meantime we can offer a pickup service for Skips Bags, Jumbo Bags or any other brand of bags if you are located in our delivery area. Often we will be able to offer a more competitive price. Simply phone our office and speak with one of our friendly staff to obtain a quote. To pickup an Aussie Skip Bag or JumboBag we require the same amount of clearance and access as when we deliver or pickup a skip bin. * Compare the cost of a bag + the disposal fee and then see how much more capacity you will get when you hire a Handybin Big Bins Skip Bin. Our smallest bin is 2 cubic metres and costs $150 (inc. GST) and can carry up to 2 tonne of waste. What is a Trailer Bin? Another emerging trend is ‘Trailer Bins’. Trailer Bins are suitable in a number of specific situations such as in building car parks or where a bin needs to be placed on a road when no other option for placement is available. It is important to make the right choice for your rubbish removal needs. Trailer Bins are available up to 4m3 and are limited in the weight carry capacity which depends on the size bin you hire and the design of the trailer and the vehicle that will be towing the bin. Experience with towing and maneuvering a trailer would be a definite advantage. We do not supply Trailer Bins at this point in time however if demand for Trailer Bins grows we may introduce this service sometime in the future.